Scammers are active again in Hamilton County as seems to be the recurring case every few months. In the latest edition, potential victims are told they missed jury duty in federal court. The perpetrator is falsely identifying himself as a member of the Sheriff's Office Investigations Division, using names of actual employees. The story will most likely change as soon as the scammer knows the story is out. As a reminder, the Hamilton County Sheriff’s Office does not call threatening to arrest an individual for missing jury duty, failing to pay taxes, or for other reasons. If a call similar to one of these is received, hang up the telephone without continuing a conversation with the caller. Never be tempted to send payment for a warrant by prepaid card or wire transfer. Body attachment warrants, tax warrants, and other government transactions should only be handled by contacting the correct office or court directly. Scammers will often stress urgency with the threat of dire consequences. This should be a good clue to investigate the call further by contacting dispatch so an officer can handle the matter. 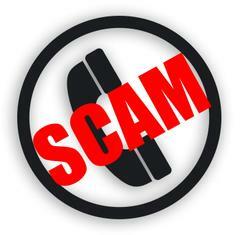 Do not be convinced by Caller ID as software is available to easily fake a telephone number. The best practice is to contact the office by researching the correct number and using it. To report becoming a victim of a telephone scam or fraud, contact Hamilton County Public Safety Communications at 317-773-1282.